One Super Nintendo and three PlayStation 2 Star Wars games are coming to the PlayStation 4 alongside a special console package, Sony announced at the Disney D23 Expo in Anaheim, California on Sunday. Super Star Wars (1992), Star Wars: Racer Revenge (February 2002), Star Wars: Jedi Starfighter (March 2002) and Star Wars: Bounty Hunter (November 2002) will all release for the PS4 in November. The four games will be included in a limited edition Star Wars console bundle. They will also be separately downloadable from the PlayStation Store. These games will come updated with improved visuals and Trophy support. Individual pricing wasn’t announced. It wasn’t revealed how extensive the graphical upgrades would be considering the age of each game. This is the first time that PS2 games, which are downloadable on the PlayStation 3, will be playable on the PS4. Super Star Wars released on the Super Nintendo in November 1992. The game is a platformer based on the first movie, “Episode IV: A New Hope” (1977) and is also available on Wii Virtual Console. The PS2 games are based on the events surrounding the movies “Star Wars: Episode I-The Phantom Menace” (1999) and “Episode II: Attack of the Clones” (2002). Star Wars: Racer Revenge is a podracing game developed by Rainbow Studios. The former LucasArts developed Jedi Starfighter, a mission-based flight simulator set before the story of Episode II. Star Wars: Bounty Hunter is a third-person action game featuring Jango Fett as the main character, also from LucasArts. All three are also available on the PS3 under the “PS2 Classics” downloadable line but don’t feature any updates or enhancements. LucasArts, founded in 1982, ceased game development in April 2013 after being acquired by Disney in October 2012. Electronic Arts now has a multi-year exclusive deal to develop and publish core Star Wars games. Sony also announced that the PlayStation 4 will have a limited edition Darth Vader-designed 500GB console bundle to release on Nov. 17. The console features Darth Vader artwork with the Star Wars logo across the top of the PS4. 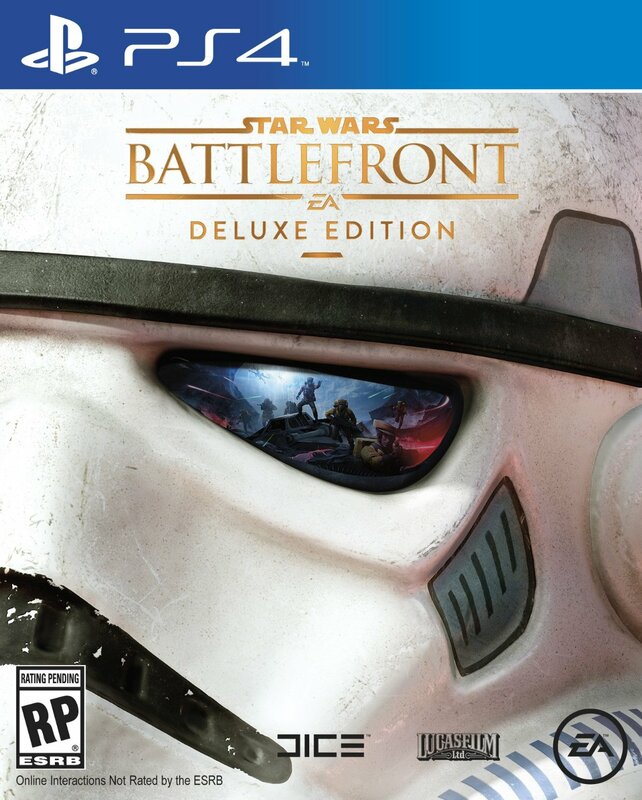 It will come with Electronic Arts’ Star Wars Battlefront Deluxe Edition and a download voucher for the four older games. The included DualShock 4 controller also has the design of Darth Vader’s chest plate, with red directional buttons, white analog sticks and buttons, red and blue top triggers and a Star Wars logo across the entire touchpad. Another Star Wars console bundle will be exclusive to Wal-Mart that features the Darth Vader system packaged with Disney Infinity 3.0 and a voucher for the four games. The Infinity bundle comes with the PlayStation-exclusive hardware package featuring the core game, the “Rise Against the Empire” set piece and figurines along with a holiday-exclusive Boba Fett figure. There will also be a basic model PS4 bundle with the standard version of Star Wars Battlefront and the four downloadable games. The PS4 included in the Star Wars bundle is the new CUH-1200 model that consumes less power and has other minor interior and exterior changes. Pricing for each bundle wasn’t announced. Pre-orders will be available soon, according to Sony. Developed by DICE with a multiplayer-focus, Star Wars Battlefront will release for the PS4, Xbox One and PC on Nov. 17 for $59.99. The Deluxe Edition includes different box art, five weapons including Han Solo’s blaster, an exclusive victory expression and early access to two downloadable maps on Dec. 1 that are set on Jakku, a new planet from the upcoming movie. Disney Infinity 3.0 will release August 28 with different figurine bundles featuring the Star Wars universe in open world levels connected with physical toys. “Star Wars: Episode VII-The Force Awakens” will release in theaters on Dec. 18.